My really good friends make an amazing Sangria. Like, seriously, out of this world delicious. I hope one day I can convince them to let me share the recipe here on the blog! Until then, I had to come up with my own sangria recipe. I figured since we were spending Halloween with them, it was only fitting to bring a fall flavored drink. 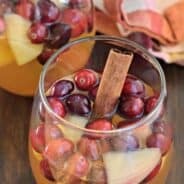 I had a gallon of fresh Apple Cider in my refrigerator that needed to be used, and I knew I wanted to give this Apple Cider Sangria a try. You guys, it turned out so delicious!! I made it the night before, giving the cinnamon sticks time to mingle and deepen the flavor of the sangria. Right before serving I poured the prosecco into the pitcher. I allowed my friends to add however much pop they wanted to “water it down.” The sangria is pretty strong, so we used about 1/4-1/2 cup pop for every 8 oz or so of sangria. By not adding the whole 2L of lemon lime pop to the pitcher, it gave us a little flexibility in the strength of the drink. If you prefer, you can totally just add the whole 2L to the pitcher. It’s up to you! I also liked adding the pop individually to the glasses as it added some extra fresh carbonation to the drink each time! You can also use Club Soda instead of the pop, which is what I will do next time! And there WILL be a next time. By adding in the fresh cranberries, this will also be beautiful for Thanksgiving and/or Christmas. My only advice would be DON’T actually eat the cranberries, as they are a little sour and not sweet. You could add in some pomegranate seeds for the red color and they would taste delicious. I just loved the fresh look of the cranberries! The apple pieces tasted amazing, soaked in cinnamon cider and booze, haha!! This shot was taken before adding in the prosecco and pop. I found that glass dispenser on Amazon, in case you were wondering. I LOVE it! When serving, I ladeled out some of the fruit into each cup, added about 1/2 cup of pop to each glass, then dispensed the sangria. When it was time for a second cup (or third, LOL), just use the dispenser as you will probably still have some of the pretty fruit still in your cup! ENJOY! 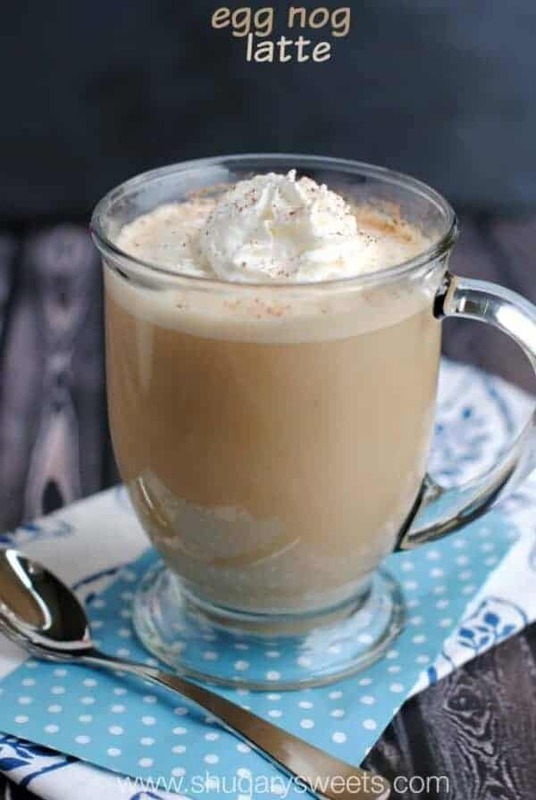 Eggnog Latte: the holidays are even better when you start your day with one of these homemade coffeehouse drinks! 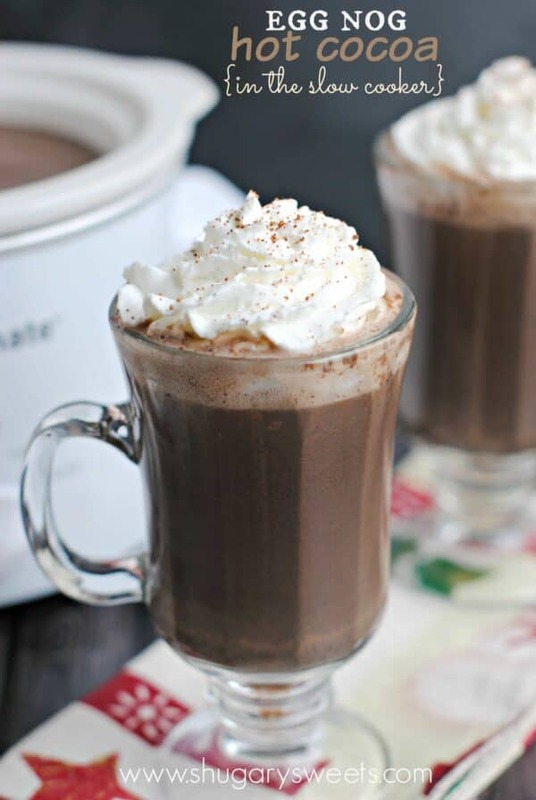 Hot Choc-Colada: one of my favorite drinks! It’s a hot chocolate, pina colada. Don’t knock it till you try it!! 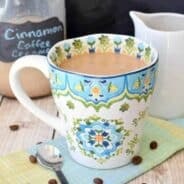 Eggnog Hot Cocoa made in the slow cooker! 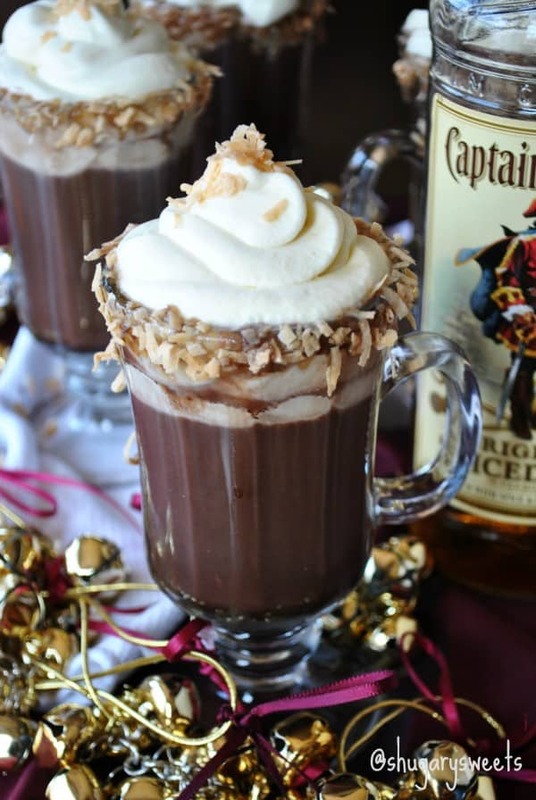 Two classic winter flavors combined in one delicious drink. 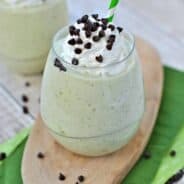 Be sure to follow my Drinks Pinterest Board for more drink recipe ideas! 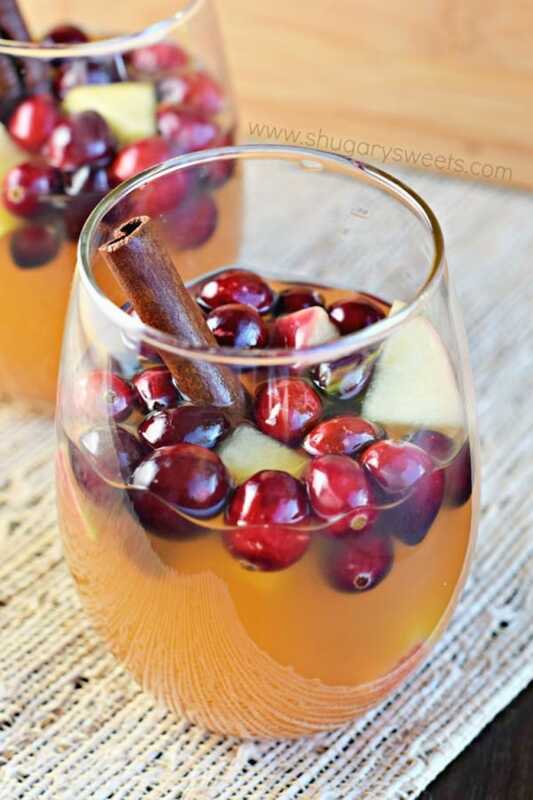 In a large pitcher, combine white wine, apple cider, brandy, diced apples, fresh cranberries and cinnamon sticks. Refrigerate at least 4-6 hours, or overnight (I let mine sit 24 hours before serving). When ready to serve, pour Prosecco into pitcher. To serve, add a ladle of fruit to each glass. Add about 1/4-1/2 cup pop to the glass (depending on how strong you want your sangria. Start with less, you can always add more to taste. 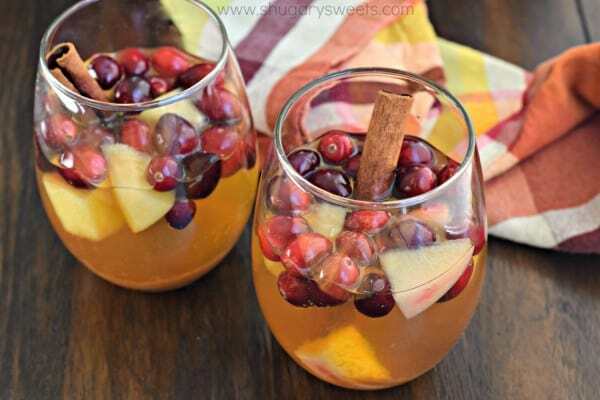 Add about 1 cup of sangria and enjoy! 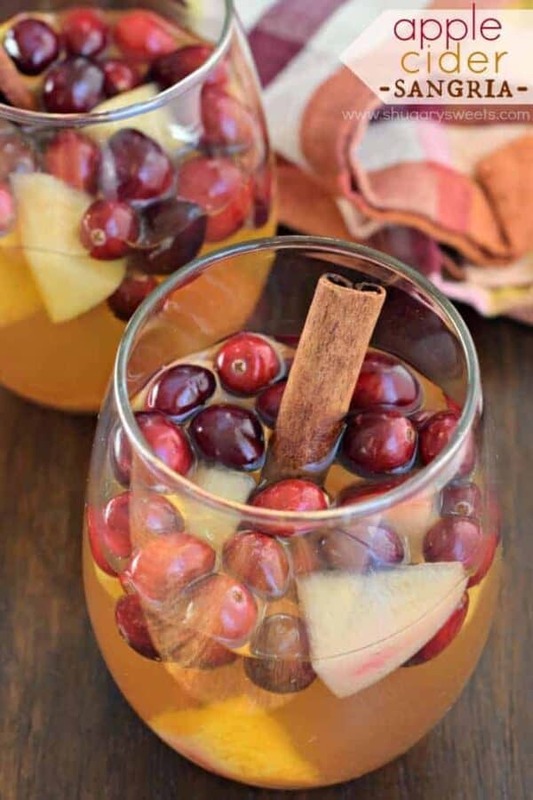 I totally wanted to make a fall sangria just like this and post it right about now to my blog but wasn’t able to find fresh cranberries in any local grocery stores until this week! Soo….that recipe won’t be happening. I’ll just make yours because it looks delicious!! And I love the dispenser! I am a sangria fiend! I love all those fresh cranberries! So festive! 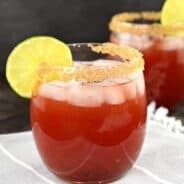 I mistakenly read the first line of your post as “I’m really good friends with sangria.” And I thought, “ME TOO.” Seriously though, I love apple cider and sangria and this looks perfect!! It totally COULD have read that, because we are friends, haha!!! I have made this a number of times and it just keeps getting better! I add 2 cinnamon sticks and I like to make it at least 24 hours in advance.